Your partner is a free-spirit with that effortlessly-elegant charm. Surging with a brilliant shine, the distinctly feminine contours of a pear-cut diamond are as rare as your partner. 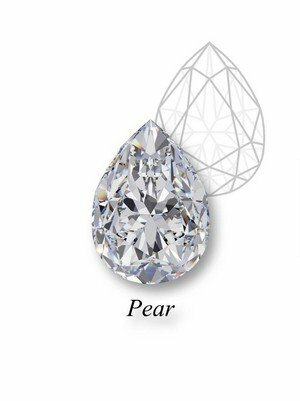 The shape of a pear-cut diamond resembles a teardrop, and, like tears of joy, it symbolizes your indescribable happiness. What is a Pear-Cut Diamond? The pear-cut diamond shape is a unique combination of the round and marquise shapes. As one of only two asymmetrical diamond shapes, the pear-cut features a tapered point on only one end and contains 58 facets. Pear-cut diamonds are as rare as they are stunning. Considered a modified brilliant-cut, the pear-cut sparkles as exquisitely as round and princess diamonds, but are considerably harder to find. Only four percent of diamonds are cut into the pear shape, and only a small percentage of those are cut correctly. For these reasons, finding a well-cut pear-shaped diamond is truly an extraordinary find. The pear-cut is unique in that its invention revolutionized the diamond trade. Shortly after inventing the truly groundbreaking diamond polishing wheel, or scaif, Flemish diamond cutter Lodewyk van Berken cut the very first pear diamond in the 1450s. He pioneered the symmetrical arrangement of facets within a diamond, which, in turn, led him to create the first pear-cut. Then, with his scaif, Van Berken was able to polish every facet of a diamond. This innovative approach helped create enhanced light refraction within a diamond. As a result of van Berken’s ingenious wheel design and technique, diamonds became more commonly used in fine jewelry pieces. Celebrated household names who have proudly donned pear-cut diamonds include Kaley Cuoco, Katherine Heigl, Princess Charlene of Monaco and the unforgettable Elizabeth Taylor. The pear-cut diamond shape is a unique combination of the round and marquise shapes. As one of only two asymmetrical diamond shapes, the pear-cut features a tapered point on only one end and contains 58 facets. Pear-cut diamonds are as rare as they are stunning. Considered a modified brilliant-cut, the pear-cut sparkles as exquisitely as round and princess diamonds, but are considerably harder to find. Only four percent of diamonds are cut into the pear shape, and only a small percentage of those are cut correctly. For these reasons, finding a well-cut pear-shaped diamond is truly an extraordinary find. Which Way Should You Wear A Pear-Shaped Diamond? Traditionally, the pear-cut diamond shape is worn with the pointed end oriented toward your wrist. However, some contemporary jewelers and avant-garde trendsetters are now setting the pear-cut to point towards the fingertips or — in some very unique pieces — sideways across the finger. Whatever your preference, the pear-cut’s distinct shape offers unmatched versatility for unique and creative styling. What Do I Look for in a Pear-Shaped Diamond? Symmetry: The ideal pear-cut diamond will have excellent symmetry, with the tip of the point lining up perfectly with the apex of the rounded end. The sides of the diamond should form uniform curves without straight edges, and each side should be symmetrical. Shape: Be sure to pay close attention to the outline of a pear-cut diamond. This shape should have delicately sloping sides and the rounded end should form a perfect semi-circle. A pear-cut diamond should not appear squared or flat. Setting: A prong setting should always be used at the point of a pear-cut diamond to avoid chipping. Additionally, the pointed end of a pear-cut diamond is the most likely area of the diamond to contain inclusions, as it was once the outer edge of the rough diamond. A prong setting at the point will help to detract from any inclusions once the diamond is set. Bow-Tie Effect: Because of their shape, pear-cut diamonds may often show a “Bow-Tie Effect”, or a dark pattern through the center of the diamond that detracts from its brilliance. Insist on examining a variety of pear-shaped diamonds under several different lighting conditions to determine the presence or severity of a bow-tie prior to purchase. Is a Pear-Cut Diamond Right for Me? Pear-cut diamonds feature an exquisite brilliance and a unique shape. Those who march to the beat of their own drum tend to appreciate the pear shape as it has a startling and unique look. Similar to a marquise-cut or oval-cut diamond, the pear-cut’s shape also complements small, slender hands well as it helps to elongate the fingers and hands. The pear shape is exceptionally versatile. Pear-cut diamonds look stunning as a solitaire ring and also suit a setting with side stones beautifully . Traditionally, the shape is worn with the pointed end towards the wearer’s wrist. But, now, it is more and more common to see the pear-cut worn away from the wrist or even laterally for a truly one-in-a-million look. A pear-cut diamond is the ideal choice for those who appreciate timeless elegance with a touch of contemporary uniqueness. At Zales, we trust the experts at GL Laboratories (GSL) to grade our diamonds. GSL, incorporated in 1985, is an independent laboratory that provides professional and unbiased diamond grading services. The laboratory studies every diamond under carefully controlled lighting and viewing conditions. Blemishes within each pear-cut diamond are noted by the GSL as clarity concerns. The GSL laboratory grades clarity as one of six grades – Flawless, Internally Flawless, Very Very Small Inclusions, Very Small Inclusions, Small Inclusions, or Imperfect. Because many small inclusions or blemishes are only visible to an industry professional with highly-calibrated equipment, choosing your perfect pear diamond for purchase is largely a subjective process. Regardless of which diamond you ultimately choose, be sure to determine whether or not any inclusions are visible to the human eye when evaluating a pear-cut diamond for purchase. Pro-tip: due to the nature of the cut, pear-cut diamonds tend to conceal small inclusions very well – especially on the pointed end. Diamond color is determined by an industry-wide grading system that begins with a D grade (colorless) and continues alphabetically with increasing levels of color up to a Z grade. The GSL uses a set of tested master stones with pre-determined color grades to decide the color grades of the consumer-ready stones at Zales. Diamond color is closely tied to the size of the diamond when viewed with the naked human eye. Small differences in the color of a pear-cut diamond are very difficult to see but may account for a considerable increase in price. Pear-shaped diamonds tend to show color quite strongly, so we strongly recommended visually inspecting each diamond prior to purchase to ensure you are completely satisfied with its color. With diamond jewelry, the color and material used for setting the diamond will also make a difference in the diamond’s color. For this reason, we recommend keeping your desired setting in mind when shopping for your perfect pear-cut diamond. The experts at GSL determine a diamond's length-to-width ratio by dividing the length of the diamond by its width. This ratio determines how proportionate the diamond is in relation to its intended shape. Your personal taste and style should always dictate how tall or squat your desired pear-cut diamond should be. Traditionally, a pear-cut diamond length-to-width ratio is 1.40 – 1.70, but the intended setting can also affect this standard ratio. We recommend evaluating an assortment of pear-cut diamonds to determine what you or your partner like best. First created in the mid-15th-century, the pear-cut diamond has a long history that coincides with the revolutionizing of the diamond industry. True to its groundbreaking history, many modern hands adorned with a pear-cut have broken from the tradition of wearing the pear’s point toward the wrist. As one of the rarest diamond shapes on the planet, pear diamonds are favored by those who appreciate exclusive elegance. From modern nobility like Princess Charlene of Monaco to classic Hollywood stars like Elizabeth Taylor, the pear-cut diamond shape shines and slims gorgeously while amplifying your unmatched creativity. For a uniquely timeless look with modern, feminine style, shop Zales rare pear-cut diamonds.